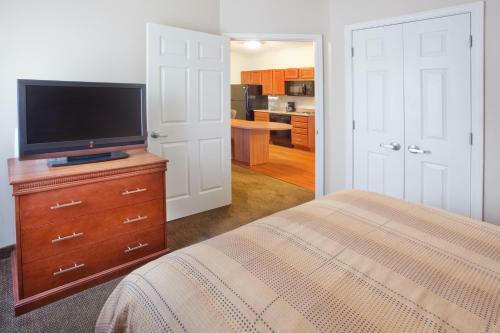 Free Wi-Fi outdoor grills and well-equipped suites with full kitchens and recliners are offered at the pet-friendly Candlewood Suites Augusta located near popular golf tournaments and Augusta's business district. The three-story 80-suite hotel features the comforts of home such as free Wi-Fi a full kitchen in each suite flat-panel cable TVs CD/DVD players recliners and work desks. Suites are decorated with contemporary wood furnishings. Pets are allowed for an added fee. Guests can work out at the on-site fitness center or at Gold's Gym GÇö both are included in the room rate. Grill up your own tasty delights at the outdoor barbeque grills; an on-site convenience store is in the lobby for last-minute additions. The hotel is on I-20 about 10 minutes by car from Augusta National Golf Club home of the Masters Tournament. Paine College and the Medical College of Georgia are about six miles away. Augusta's central business district and the landscaped Riverwalk which runs along the banks of the Savannah River are also about six miles away. Fort Gordon is 13 miles away. Hartsfield-Jackson Atlanta International Airport is about 150 miles away. Add Candlewood Suites Augusta to your free online travel itinerary.